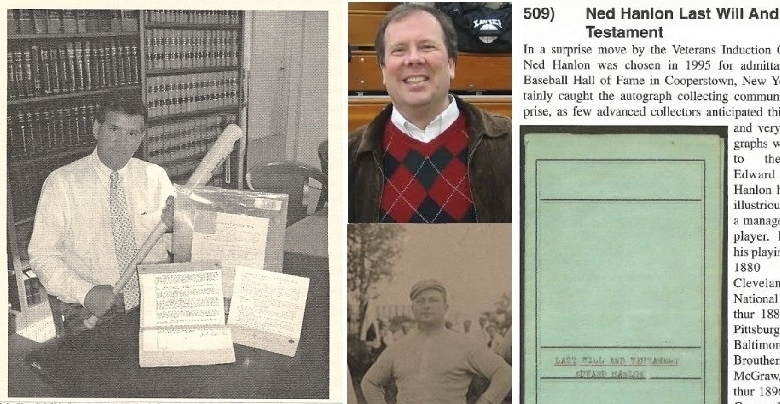 So the hobby has at least one good guy, and his name is Don Hubbard. 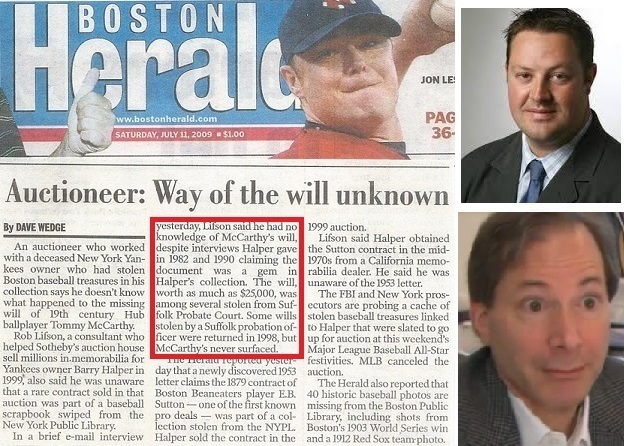 But what gets me is the apparent ease with which Barry Halper, in cahoots with Lifson and D’Alonzo (who had to know about their boss’s narcissism and thievery) managed to bamboozle so many people for so long with his suave charm and earnest demeanor into believing he was merely an honest collector. The fraud he pulled off over the course of decades is mindboggling in its scale, and perversely admirable in its simplicity: Steal or forge stuff that most people aren’t even aware has much value, fabricate an emotionally manipulative story about how you came to possess it, and resell it to collectors as unscrupulous as you are for a huge profit who then turn around and intentionally imbue the stolen items with an undeserved aura of authenticity, because to do otherwise would be to admit they also are either crooks or dupes. And the cycle continues while honest, intrepid investigators like Peter Nash and Don Hubbard shine a light on the dark side of the hobby. The cycle of thievery as well as the conspiracy of silence and collusion among unscrupulous or lazy collectors makes for fascinating reading, but the reality of all this greed and criminal conduct connected to a game that is supposed to represent the best within ourselves is truly heartbreaking. Some of these wills have been sitting in collections for a few decades without recoveries being made. The McCarthy has been gone over three decades. Why aren’t the courts and municipalities having their local law enforcement going after these? I think in all of the cases where wills were recovered the authorities were involved. 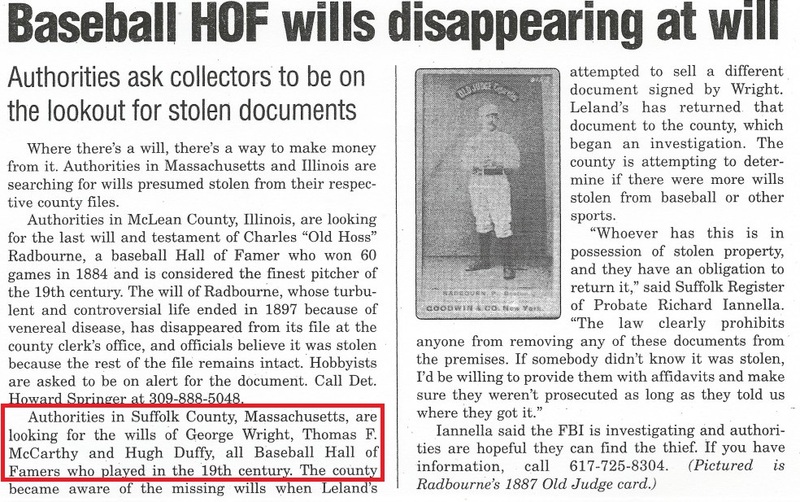 The Boston court recovered several including Duffy, Connolly, Wright and Yawkey and in Illinois local police helped recover the Old Hoss Radbourn. 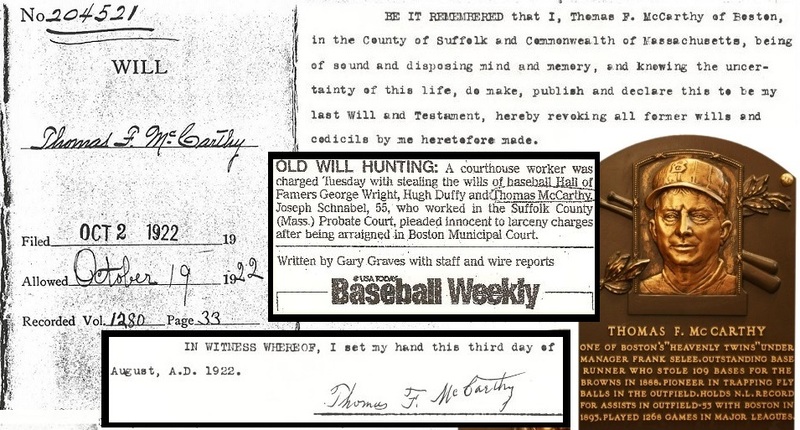 In New York the FBI and Attorney General’s office got involved and Babe Ruth’s will was recovered. I don’t think that’s been the case with any of the other stolen wills and that’s why they are still missing. Is this the same jack heir who sells autographs in NJ? Whats the story on him? That is the same Jack Heir. According to several people involved in that case Heir was listed as a victim in court papers and had to reimburse several buyers.